KIEV, Ukraine -- Ukrainian President Viktor Yanukovych sees state-run NAK Naftogaz Ukrainy delivering energy independence. Naftogaz, Ukraine’s biggest employer with 175,000 workers, received more than $5 billion of subsidies in 2011 and 2012 as regulated gas prices and expensive Russian energy imports led to losses. International lenders see the company as a money pit that posted losses for six of the past eight years. Naftogaz, Ukraine’s biggest employer with 175,000 workers, received more than $6 billion of subsidies in domestic bonds from 2009 to 2012 as regulated gas prices and expensive Russian energy imports led to losses. Handouts to the company, whose pipelines carry about 25 percent of Europe’s gas imports, prevented Ukraine from balancing its budget over the past decade in a nation whose graft ranking is on par with Syria, according to data compiled by Berlin-based Transparency International. “Naftogaz captures Ukraine’s political and economic corruption like a raindrop,” said Volodymyr Omelchenko, head of energy research at the Razumkov think tank in Kiev and director of oil shipments for Naftogaz from 1998 to 2003. Two days of meetings between Yanukovych and Russian President Vladimir Putin ended July 28 without progress on the gas talks. The International Monetary Fund said July 25 it hasn’t discussed loan policies with Ukraine since April when negotiations over a $15 billion aid package were abandoned. The country is facing a reserves squeeze this month as the central bank has to repay $950 million to the IMF and $253 million to domestic bondholders, analysts at Moscow-based VTB Capital said July 30. Ukraine’s biggest opposition party, led by jailed former Prime Minister Yulia Tymoshenko, alleges that Naftogaz is being driven toward bankruptcy as management uses purchases of equipment and gas to embezzle cash. Yield on 2014 Naftogaz bonds, which the company restructured in 2009, rose to 9.686 percent as of 4:08 p.m. in Kiev, to the highest level since July 17, data compiled by Bloomberg shows. The government has denied wrongdoing. Its press office hasn’t replied to e-mails and phone calls seeking comment. Officials at Kiev-based Naftogaz also haven’t responded to requests for comment. “While this company exists, one shouldn’t expect any political changes as it’s linked directly with the interests of key politicians,” Omelchenko said. For investors, Naftogaz offers a window into how the nation of 45 million runs its finances. The government won’t cut the gas subsidies that are impeding a potential bailout from the IMF, while a failure to boost corporate transparency is blocking funds from the European Union to help repair the nation’s aging pipelines. Domestic gas production fell 1.1 percent to 19.3 billion cubic meters in 2012. The IMF is pushing Ukraine, the first Soviet republic to produce gas before output moved to Siberia, to reduce household energy subsidies to narrow a budget gap that reached 3.8 percent of gross domestic product last year. The government says people can’t pay more. To lower energy costs, Ukraine is trying to diversify imports away from Russia, which supplies half its gas. Russia says it may cut the payments if it gets Naftogaz’s pipelines in return and if Ukraine agrees to join a Russia-led customs union that also includes Kazakhstan and Belarus. Opposition politicians have told the 63-year-old Yanukovych that would be tantamount to treason. One attempt at energy independence, a plan to build a liquefied natural gas terminal near the Black Sea city of Odessa, went awry. Vladyslav Kaskiv, head of the State Investment Agency, called a news conference on Nov. 26 to announce that Spain’s Gas Natural SDG SA (GAS) and other European companies would build an 856 million-euro ($1.1 billion) LNG depot on the Black Sea near Odessa. Jordi Sarda Bonvehi, who claimed to be the representative for the European consortium at the signing ceremony in Kiev, which was attended by Azarov and then-Energy Minister Yuriy Boyko, smiled, shook hands with the Ukrainian officials and then quickly left. Gas Natural denied any involvement in the project about 30 minutes after the meeting ended. The company said in a May 30 e-mail that in December it filed a lawsuit against Bonvehi at the Audiencia Nacional, Spain’s highest court, for fraud and forging commercial documents. A man who answered a call to the phone number provided by the Energy Ministry and said his name was Bonvehi acknowledged in November that he wasn’t authorized to represent Gas Natural. Since then, Bloomberg News has been unable to verify the person’s identity or reach him on the same number. Kaskiv, who kept his job, called the affair a “provocation” to damp Ukraine’s energy-independence goal. “That was a very painful event for a lot of people in the government,” Nick Piazza, chief executive officer of SP Advisors, a Kiev-based investment company, said by phone. The fiasco isn’t the only scandal involving Naftogaz to tarnish Ukraine. 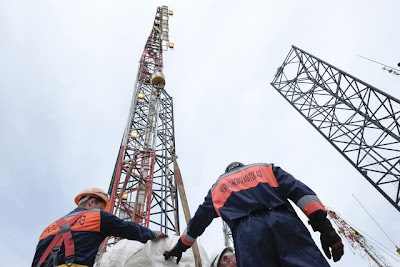 The opposition party of Tymoshenko, who’s serving a seven-year prison term for abuse of office, says the price of a 2011 oil-rig purchase by Naftogaz was inflated so managers could pocket the difference to the true cost. Police in Latvia, where the seller has a bank account, froze the company’s access and opened a money-laundering probe into its role in the transaction, Ukrainian television channel TVi reported in December. The Baltic nation’s police have confirmed the probe, declining to comment on the freeze claim. Ukraine hired Halliburton Co. (HAL) to audit the purchase and the U.S. company found no evidence of wrongdoing, with additional equipment, services and delivery accounting for the difference in the two prices, according to Boyko. Halliburton hasn’t replied to questions to its Moscow and Houston offices. Claims to the contrary stem from “certain individuals” who wanted to stop Ukraine drilling in the Black Sea, Boyko said on television in January 2012. Ukraine ranks 144 of 174 countries in Transparency International’s 2012 corruption perception index, level with Syria and the Congo Republic. Law-enforcement agencies need to take advantage of legal improvements, according to Qimiao Fan, the World Bank’s director for Ukraine, Belarus and Moldova. “There’s progress on the legislative side, but the legislation isn’t being implemented consistently,” he said April 2. While the World Bank, the European Bank for Reconstruction and Development and the European Investment Bank said in 2009 that they’re ready to help fund an overhaul of Ukraine’s aging pipelines, no money has been disbursed because of what the lenders consider insufficient progress on improving transparency, in particular by splitting the company into separate units for extraction, transportation and sales. Naftogaz will be divided into several companies “in the nearest future,” Yanukovych said Jan. 24 in Davos, Switzerland, repeating a pledge he first made three years earlier. The government blames opposition lawmakers for delaying attempts at a revamp. Azarov’s cabinet sought support for a bill submitted to parliament April 26 to allow the potential sale of the company or the leasing of its pipelines before parliament began its summer break this month. The proposal may have been a means of putting pressure on Russia for a quicker decision on gas prices, rather than an attempt at a meaningful overhaul of the company, Olga Shumylo-Tapiola, a visiting scholar at the Carnegie Europe in Brussels, said May 30. “I’d like to believe that there may be some movement in a positive direction, but if one looks at the dynamics of everything that’s been happening in Ukraine in the past several years, I’m not sure this will benefit the country,” she said.